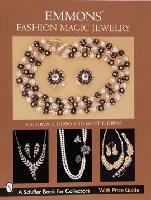 Fashion Magic jewelry by Emmons was sold at "home fashion shows" from the late 1940s until the early 1980s. Of better than average quality, it was promoted as being "reasonably priced." Today, it is still reasonably priced; moreover, it is highly collectible. Despite its collectibility, there are no detailed guides to help the collector, only a few pictures in the various books on Sarah Coventry®--a sister company of Emmons under C. H. Stuart, Inc. But my sister-in-law and I have changed that. Our book on Emmons jewelry has been published by Schiffer Publishing Ltd. It contains over 500 photographs of Emmons jewelry along with a history of the company.